It’s been a whileeee! Ok so I’m unforgivable, I know, two weeks without posting anything ever happened before. So while I’m stuck in bed with the flue, I have finaaaally some time to post a new outfit! 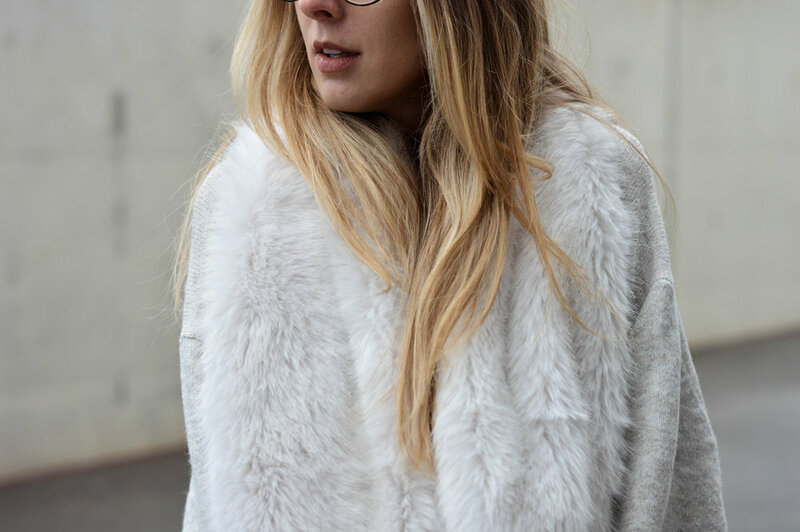 In few words: white, faux-fur, oversize and cosiness. Well, my everyday essentials for winter! For the colours… you don’t change a winning team haha! White, black and some shades of grey as always, always and always. When I first saw this faux-fur scarf I fell in love straight away. But when it came to wear it on the street, my mind reminded me it was maybe too diva - which is the extreme opposite of myself. So it became quite a psychological problem for me until I found the perfect way to wear it. I choose an oversized jumper and a ripped jean - casual clothes that contrast perfectly with faux-fur and give it a cosy touch instead of a too much style. All the details of the outfit are on the shop my closet beauties! Also, you can check out my sales selection on the tab “Soldes” for some pretty good deals.